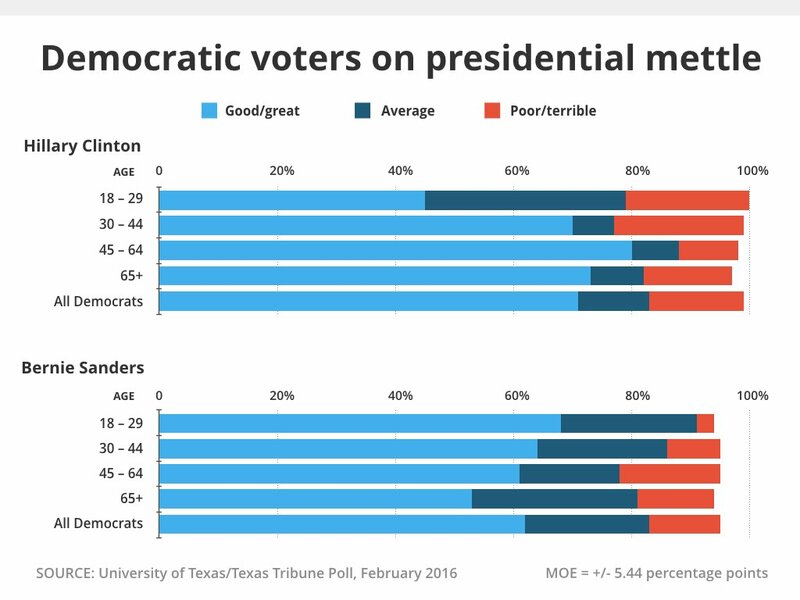 UT/TT Poll: Texans See Presidential Choices as "Poor" and "Terrible"
Hillary Clinton, Donald Trump, Bernie Sanders and Ted Cruz have something in common, according to the latest University of Texas/Texas Tribune Poll: Roughly half of the state’s likely primary voters think they would make poor or terrible presidents. Voters were stingy with their “great” and “good” ratings, but Cruz, with 36 percent, got more positive responses from voters. Sanders and Clinton got high ratings from 30 percent of voters, Trump from 29 percent and Marco Rubio from 25 percent. More than half of the likely primary voters said Trump and Clinton would be “poor” or “terrible” presidents, with the emphasis on “terrible.” Clinton got that forecast from 49 percent of voters, Trump from 42 percent — not surprising since those responses came from voters in both parties, but an ominous finding in the search for one person who will lead the country for four years. “The suggestion here is that for candidates, particularly Trump, where you have 12 percent who think he could be great,” said Daron Shaw, a professor of government at the University of Texas at Austin and co-director of the poll. “But then you get 42 percent saying he would be terrible, which outstrips everything. The candidates did better with their own voters, but Republicans likely to vote in that party’s primary were harder on their candidates: 38 percent said Trump would be a poor or terrible president, 25 percent said the same about Rubio and 22 percent forecast that future for a President Cruz. In contrast, 12 percent of Democrats had those kinds of expectations for Clinton and Sanders. “Democrats are more content with their candidates than the Republicans are,” said Jim Henson, director of the Texas Politics Project at UT-Austin and co-director of the poll. “You’re seeing a somewhat more civilized disagreement in the Democratic Party than you are in the Republican Party. “They haven’t alienated as many of the people they are trying to attract,” he said. Sixty percent of conservatives said Cruz would be a “great” or “good” president — a number driven by the most conservative voters in the party. Among those who identified themselves as “extremely conservative,” 89 percent put Cruz in the top categories. And 70 percent of “somewhat conservative” voters shared that view. Trump’s worst numbers came from the same place where Rubio did well — the conservative leaners. Half of them said he would be a lousy president, and 35 percent said he would be above average. The presidential campaign has been hard on the images of the candidates; at least 40 percent of Texas voters have unfavorable opinions of each of the people in the top spots in both primaries. Some have it really bad, like Trump, a candidate coming into a state where 59 percent of the voters have an unfavorable opinion of him. Clinton has detractors here, too: 53 percent of the voters have an unfavorable opinion of her. They’re not crazy about anyone, if the “unfavorable” opinions are your guide: Cruz, 48 percent; Sanders, 43 percent; Michael Bloomberg, who has talked about running as an independent but hasn’t so much as made a speech, 40 percent. 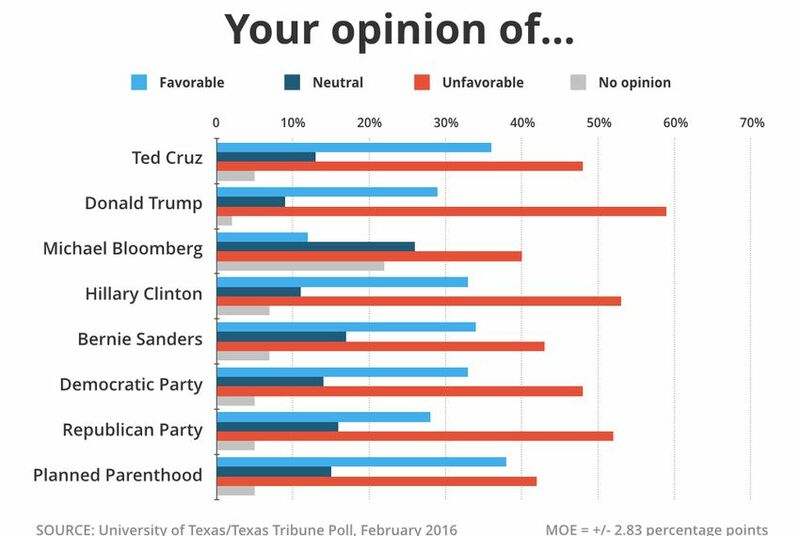 On the positive side, 36 percent of Texans have favorable opinions of Cruz, followed by Sanders, 34 percent; Clinton, 33 percent; Trump, 29 percent; and Bloomberg, 12 percent. Bloomberg remains somewhat unknown, with 26 percent having a neutral impression of him and 22 percent saying they have no impression at all. Those are overall impressions of voters of every persuasion. Candidates do better with their own voters than with those from the other party; Cruz, for instance, got favorable marks from 64 percent of Republican voters while getting unfavorable marks from 71 percent of Democrats. Trump also leaves the Democrats cold — 77 percent said they have an unfavorable opinion of him, but he has some weaknesses on the Republican side, too, where 47 percent view him favorably and 42 percent view him unfavorably. Clinton is well-liked by Democrats, leaving 67 percent of them with a favorable impression, but Texas Republicans are overwhelmingly negative: 91 percent have an unfavorable opinion of her. Only 4 percent said they have a favorable impression of Clinton. Republicans like Sanders better, but only a little: 10 percent said they have a favorable impression, and 76 percent said their opinions were unfavorable. Most Democrats — 59 percent — said they had a favorable impression of him, while 26 percent of Democrats said they had an unfavorable impression. Texas voters are sour about institutions, too. Only 33 percent have a favorable opinion of the Democratic Party, while 48 percent have an unfavorable one. In fact, 10 percent of the party’s own voters have an unfavorable impression of it. The Republican Party has left a favorable impression on 28 percent of voters, a negative impression on 52 percent. As with the Democrats, some of their own partisans have an unfavorable impression, and in a party that is marked by internal divisions and a boisterous primary, it’s a bigger number: 26 percent of self-identified Republican voters have an unfavorable opinion of their party. Planned Parenthood came closer than any of the candidates or institutions to breaking even: 38 percent of the voters said they have favorable impressions of the organization, while 42 percent have unfavorable opinions. Voters were asked where each candidate belongs on a seven-point scale from “extremely liberal” to “extremely conservative,” with “4” representing someone right in the middle. Sanders was rated most liberal by those voters, with an average score of 2.02. Clinton was next, at 2.41, and Bloomberg, at 3.17, was the only other candidate on the liberal side of the scale. The most conservative in the pack, with a mean score of 6.21, was Cruz, followed by Carson, 5.55; Rubio, 5.19; Jeb Bush, 4.71; and Trump and Kasich, each at 4.63. Bush dropped out of the race after Saturday’s South Carolina primary but remains on the Texas ballot. The Texas primaries for both the Republicans and the Democrats take place on March 1. Early voting began a week ago and continues through Friday. The University of Texas/Texas Tribune Internet survey of 1,200 registered voters was conducted from Feb. 12 to Feb. 19 and has an overall margin of error of +/-2.83 percentage points. Among self-identified Republican primary voters, the margin of error is +/- 4.27 percentage points; among self-identified Democratic primary voters, it is +/- 4.57 percentage points. Among likely voters in the Republican primary race, the margin of error is +/- 4.86 percentage points. Among likely voters in the Democratic primary race, the margin of error is +/- 5.44 percentage points. Numbers in charts might not add up to 100 percent because of rounding. 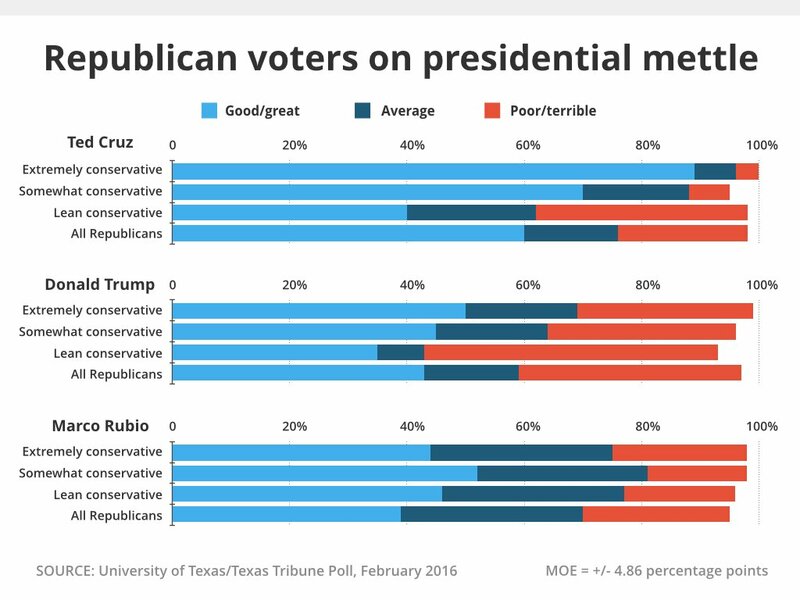 This is one of a series of stories from the latest University of Texas/Texas Tribune Poll. Yesterday: How the candidates stand a week before the Republican and Democratic primary elections. Tomorrow: Texas voters on immigration, guns and other issues. Disclosure: The University of Texas at Austin is a corporate sponsor of The Texas Tribune. Planned Parenthood was a corporate sponsor of the Tribune in 2011. A complete list of Tribune donors and sponsors can be viewed here.